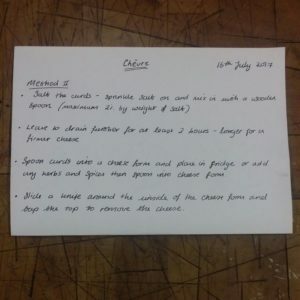 After my first successful, and very tasty, attempt at cheesemaking I was keen to try more techniques for incorporating the herbs that I grow into my cheeses. I love Rosemary and fortunately Rosemary grows very well in my herb garden so I always have a plentiful supply. The only problem with Rosemary is that, even chopped up, it can be a bit woody when used in dishes. To avoid this I decided to try infusing my cheese with fresh Rosemary. 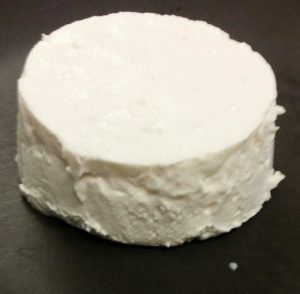 I used the same technique as I did to make my first batch of fresh goat cheese. Instead of adding chopped herbs like I did with the Basil and Garlic cheese I put a bunch of fresh Rosemary in with the milk while I was heating it and while it cooled. 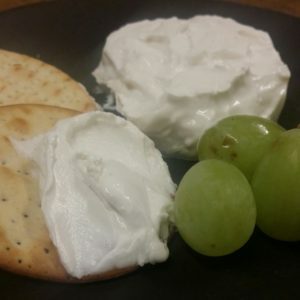 I decided to split the Rosemary infused curd into two and add some homegrown Elephant Garlic into one half. I used the same technique as in my first batch of cheese. I crushed two cloves of Elephant Garlic and folded the garlic into the curd making sure it was evenly distributed. I did add a sprinkle of Rosemary on top of the Rosemary infused cheese to distinguish it from the Rosemary infused and Elephant Garlic cheese. Here’s a picture of the finished cheeses. 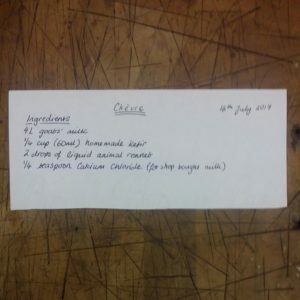 While I was making the cheese I wasn’t sure whether curds would have enough Rosemary flavour just from the infusion but fortunately there was nothing to worry about. The cheese texture was the same as my first attempt a bit Feta like but it had a delicious Rosemary flavour. The Elephant Garlic worked well too it complemented the Rosemary and didn’t overpower it. 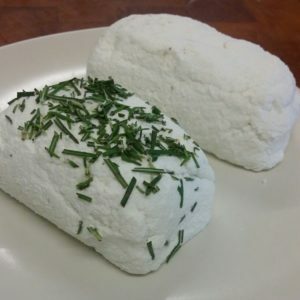 I’m definitely going to try more herb infused fresh goat cheese. 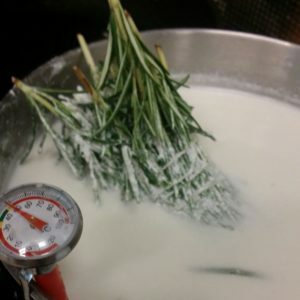 With a large bunch of fresh Rosemary it was quite easy to remove it from the milk. 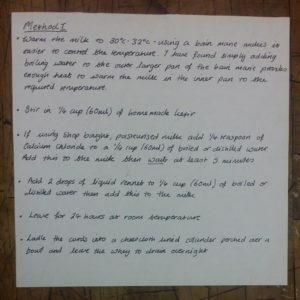 I might also experiment with using a small muslin bag with herbs in or use some make your own herb teabags. I have some large tea bags from making herbal bath teas that might do the job. These herb teabags could be added directly to the milk or, as the book Mastering Artisan Cheesemaking suggests, I could make a herb tea and then add the tea to the goat milk. It might be interesting to try combinations of herbs.